Panchkula, October 28, 2018: Defending Champions Minerva Punjab played their first match of the 12th Hero I-League season hosting Goan giants Churchill Brothers on home turf at the Tau Devi Lal stadium in Panchkula, Chandigarh. The two sides split points in a goalless draw at the end of 90 minutes, in a match characterised by the missing final ball and a dearth of imagination in attack. Churchill Brothers gave a good account of themselves while Minerva showed glimpses of what they are capable of in the second half, but both teams failed to break the deadlock. Irish UEFA Pro license holder Paul Munster, Minerva’s newly appointed technical director and coach Sachin Badadhe, chose to go in with an attacking formation with Nigerian Philip Njoku and the young and talented Souvik Das as wing backs in front of a three-man deep defense led by Ivorian Lancine Toure. Akash Sangwan and the mercurial Nongdamba Naorem, also their under-22 start of the day, were played attacking left and right-wingers. William Opoku Asiedu and Manandeep Singh were the target men upfront while Bhaskar Roy was preferred to man the Minerva woodwork. Churchill also had a new coach for the season in Romanian Petre Gigiu and he opted for a more conservative 4-4-2 formation with Trinidadian Willis Plaza and Gambian Dawda Cessay upfront with a four-man midfield led by Ugandan Khalid Aucho and Richard Costa at its heart. Lamgoulen Hangshing was their under-22 pick in midfield and the youngster certainly impressed in the game before he was replaced early in the second half, with his technique and vision. James Kithan was preferred in goal and the four-man backline was led by the likes of Lebanese Hussein Eldor and Mohanraj. Minerva started from left to right of the field in their now familiar deep and light blue stripes while Churchill were in all red. The Goan side, however, had the better of the exchanges in the first half, led by good performances by Dawda Cessay in particular who was the most enterprising, as well as Aucho and Hangshing in midfield. However Plaza it was who was at the end of most chances that Churchill would create in the half and two of his misses stood out. In the ninth minute, the Trinidadian found himself at the end of a free header after a corner taken short by Cessay saw Aucho float in a wonderful cross from the right flank. His low angled header went wide from just outside the goalkeeper’s area inside the box. A minute later Cessay unleashed a low angled drive which beat Roy and just went wide off the Minerva left upright. In the 20th min, Plaza muffed up the best chance of the half when Hussein Eldor snatched a ball away from a defender deep inside the Minerva half. He laid the ball onto the path of Plaza who after beating last defender Toure, just had an onrushing Bhaskar Roy to get away from, but the Minerva goalie made a crucial interception from right under Plaza’s feet to deny Churchill a chance at the lead. The first half, as a result, ended goalless. Two substitutions by the Champions within the first quarter of an hour in the second half saw the home side charge back to life. Dilliram Sanyasi, a talented winger from Delhi came in place of Naorem in the 54th minute while Ivorian Alexandre replaced Manadeep upfront. This injected the pace and flair needed and along with an inspired performance from Hero of the Match Njoku, Minerva looked threatening for most of the half. Njoku got the first clear chance for Minerva in the 64th minute of the game when a low cross from Souvik from the right saw the ball fall favourably for the Nigerian inside the box. His curling right footer on the turn sailed over the bar. Then a 1-2 between Njoku and Sangwan almost saw the Nigerian through to goal but Eldor, who had a brilliant match at the heart of the Churchill defense, brought about a crucial interception. 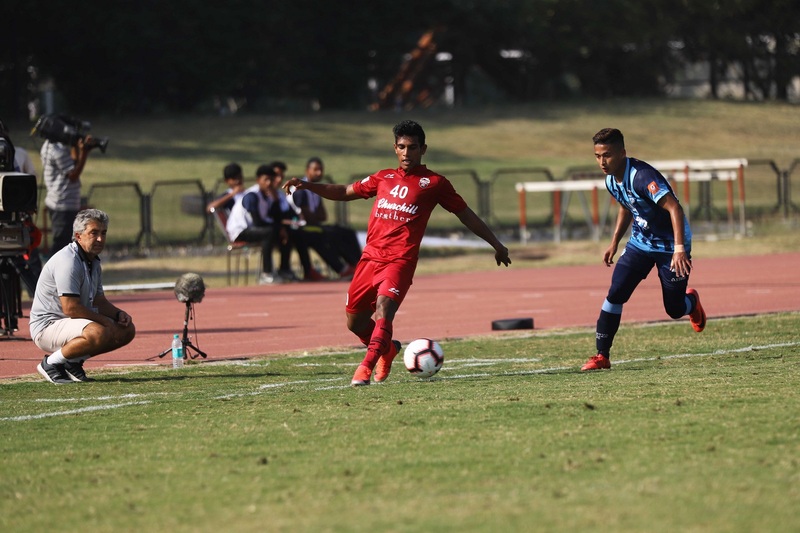 Souvik Das had also earlier played some threatening crosses into the box but a goal eluded the game, even as Minerva brought in striker Sathyan Sabeeth for one final push for a win. In the 90th minute, it was substitute Uttam Rai who had a golden chance to win it for the away side in fact, when an innocuous floater from Mohanraj on the overlap from the left, found him with just Bhaskar to beat. However, his volley went straight at the keeper.